MSNBC Apologizes for Telling the Truth! Earlier this month, MSNBC aired a well-known graphic that illustrates how Israel has taken over Palestine as the occupation has grown over time. But later it apologized for using the maps that illustrate how Israel has been gobbling up Palestinian land. What a crock of doodoo! Can't believe this stuff! Thanks, Sam. BLACKMAIL! Stop it NOW! How pisspour of the two brave ones to eventually cave in. WTF, it doesn't say "State of Palestine", so Palestine equals land of Palestine/ Palestinian land. How Fletcher stumbled, but, gladly corrected himself in time! These maps were not designed to also include demograhics in numbers, only to show the shrinking, STOLEN landmasses. It is WRONG to now call them "false" and "not factual accurate", they ARE, only not complete to Israel's liking. But heck, they're just some small graphics, not an encyclopedia! There we have those Nutyahoo's tentacles again, grabbing and crushing everything and everyone they can get hold of. The bad thing, even if you'd cut them off, like with octopuses, even more would grow back. Eliminate that monster! Freedom of the press turned into freedom of the opPRESSors to do whatever they please. Do you think that was covered in their pact with God? Guess that depends on whom they regard as God... a golden calf is surely included I think, well, nowadys it most often comes in green, that is. Sam, are you not feeling sad what the station that your state was once home to, has turned into? From a proud rather left leaning channel speaking truth to power, you now get a taste of a Rockefeller Center based Murder Society Nutyahoo's Broadcasting Culture! "Crafty" and more weapon, etc., build up. Thankfully, the land mass over the time period hasn't changed in shape; just the stupidity of the politics that is flowing in and around that land. Not so fast, Darren..don't hold your breath on that.How do we know this may not change in the future ? I bet some are mulling this already. MSNBC has joined the rest of the Corporate Faux News. Not that it was "terrific" to begin with, but too many only receive their news off of the cable channels. I posted a news story last April that they were only going to get worse, and MSNBC has. Let Ed Schultz go as he was trying to explain what TPP was. Omg, can't have that on Corporate TV. The map is wrong! Jordan annexed the West Bank in 1950. They took more land off the Palestinians than the Israelis did and they, not the Israelis, rubbed 'Palestine' off the map in doing so. If Jordan hadn't made an unprovoked attack against Israel in 1967, and lost, the Israelis wouldn't even be in the West Bank. Strange, the correspondent for my Dutch newspaper in Tel Aviv always speaks of Palestine when speaking of the occupied territories and the land before Israel became a state. No one has ever got upset about that, he never had to change it or apologize for it, and yet he's still doing and allowed to do an excellent job on an almost daily basis for a number of newspapers and our national news. Perhaps Israel has already given up on small, wayward Netherland and couldn't be bothered to try and convince us otherwise, because this map and its implications have been published many times before here and is commonly accepted. Three or four maps in succession have been used to illustrate how Israel's settlements and land grabs have gobbled up most of Palestinian land, i.e. 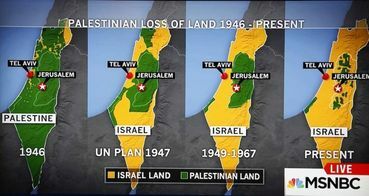 land that was not given to the state of Israel in 1948, especially on the West bank, and this is what MSNBC has also commented on, but as far as I can tell, they didn't have to apologize for that? Does Israel think (all) Americans are so stupid that if you don't call the land Palestine, Americans automatically think it was rightfully Israel's, given to them by the British? Nothing like a twisted media explanation to conform to what The-Powers-That-Be want to be seen. I quit watching all on msnbc except for Rachel Maddow most nights. Sad to see it devolve into mush. The UN partitioned the land and gave Israel statehood, on a majority vote. It was nothing to do with Britain. Britain abstained in the vote. Britain double-crossed the Jews and reneged on the plan for a Jewish homeland - that's why Jewish extremists attacked the British forces (King David Hotel etc. ).When the British mandate came to an end, we packed up and went home, leaving only chaos. Before partition the region was called the British Mandate Territory - Palestinian Protectorate. And before that it was part of Ottoman Syria. Here's yet another candidate caving in to AIPAC- please sign the PETITION! This map is wrong, about time they apologise for their misinformation! Trans-Jordan (now simply called Jordan) was part of the Palestine Mandate, it used to be called Trans-Jordan Mandate of Palestine and is 80% of the land of the Palestine Mandate. Israel was under the control of the British Mandate (who got it after the Ottoman Empire fell apart) and was then awarded to the Jewish state in 1947 by the UN. This is a question of political control, and there never has been a 'palestinian' political control of what is incorrectly labelled 'Palestine' on this map. Talk about rewriting history with this MSNBC map!!! An outrage!!! I guess we should at least be thankful that they apologised for their lies .. I'm seeing a few errors here, about Britain creating the state of Israel, about the U.N. doing it, and just in general what does or can create a state. There are three legal requirement for an organization to declare itself a state in the global state-system. The first is that it demonstrate an ability to enforce a monopoly on the use of force within some claimed territory, at least in terms of the state-system. That means enforcing a monopoly on taxation, law-making and enforcement, and enforcement of edicts to the extent that other states are willing to try to enforce their own in that territory. This can be done by consent of all other states (usually neighbours) that might try, or by war. Usually it is mix of the two, where other states find it impossible or more costly than its worth to try to control the territory in question. In Israel's case, this was demonstrated by the war of 1947-1949. People talk all the time about how territorial claims based upon war are illegitimate, but that's just BS. Conquest of territory in wars of aggression not recognized by the government of the prior legal holder of the territory, or recognized only under duress, are not to be recognized, but war is otherwise a fully legal, even if brutal, tool. This is not meant to be an ethical thing: It's just ideals compromising with reality a they always must. The third, again, is about practical reality: The state must have the means to engage in diplomacy in the global state-system. That's where the whole issue of state-recognition makes a difference, so the point is moot if the state is not present in that forum. This is where the U.N. comes into the picture with Israel. Forget the Partition Plan: Under its own terms, because it never got approval from all parties, it never went into effect. The U.N.'s admittance of Israel as a member-state on equal ground with others was the original clear confirmation that this requirement was met. Now, in light of what constitutes a state, and looking at the history of the region, let's look at the maps again. First,the history: The first map is technically correct in isolation, but incredibly misleading in the context of the other two. First, that was in fact the administrative region known as Palestine in 1946. In context, it is the earliest point on the timeline given and a naive reader would assume that going back further one would see something similar. In 1945, the administrative region also included modern-day Jordan. This omission produces a false narrative of conquest. Second, let's look at what the maps are of. The first map is of an administrative region, not a state. The British enforced a monopoly on the enforcement of legal authority there with respect to the state-system. The British handled border-security and foreign affairs o behalf of the area. One notorious case of both was the turning back of Jewish refugees from Europe, done by the British and not the Palestinians. Third, Britain had not formally recognized any Palestinian state by any treaty or unilateral policy. It was a British administrative region. The rest of the maps show the territory claimed by a state and the rest of the administrative region within which it was established. "Palestine" in those maps was, again, not a state: It was still a set of administrative regions, now under Jordanian and Egyptian control rather than British. So what we're looking at here is two separate distortions which "coincidentally" support the same particularly commonly believed false narrative. Two of something is typically a coincidence, but in the absence of other such distortions and following a pattern of similar distortions by the same agency, the idea that this was an honest report with only inevitable minimal distortion, or even that professional due diligence was adhered to, is unsupportable. MSNBC apologized for airing a false report. Sam just keeps insisting it's true because, well, I've made my understanding of Sam's motivations very clear on Care2. As a Jew (and as a human being), I am greatly disappointed at MSNBC's "apology". It used to be that Americans felt moral outrage when exposed to this sort of malarkey. Given what has been done in the name of Americans, is the US any different in its actions than Nazi Germany? We may or may not have detention camps (yet), but disagreement with Israel is increasingly seen as a blasphemous action. In this respect, Israel and its friends are supporting state-sanctioned terrorism...much like what America has been doing in Latin America for decades. Get used to living in a state run by corporations (If the TPP passes, it's the end of freedom in America)...which is the economic definition of Nazism.